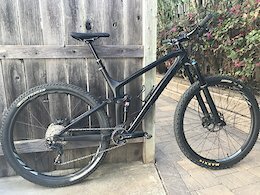 2017 Trek Fuel EX 9.8 29er 21.5 Frame Matte Black with upgrades Frame: OCLV Mountain Carbon main frame & seatstay, alloy chainstay, ABP, Boost148, Knock Block steerer stop, Full Floater, EVO link, E2 tapered head tube, Mino Link, Control Freak internal routing, Carbon Armor, PF92, ISCG 05, G2 Geometry, 130mm travel Fork: Fox Performance 34 Float, GRIP 3-position damper, E2 tapered steerer, G2 Geometry w/51mm offset, Boost110, 130mm travel Wheels: Bontrager Line Comp 29. Option with Ibis 935 carbon wheels with Industry 9 hubs. Front Tire: Maxxis Ardent 2.4 Rear Tire: Bontrager XR3 2.4 Shifter: Shimano XT M8000 Derailleur: Shimano XT M8000 Crank: Shimano XT M8000 with 30T chainring Cassette: Shimano XT M8000 11-40, 11 speed Brakes: Shimano XT M8000 with 180mm Ice Tech rotors Seatpost: Bontrager Line Pro Stealth 31.6 with bar mounted lever Bars: Bontrager Line Pro Carbon 35mm diameter, 750 mm width Stem: Bontrager line pro 50mm Saddle: Bontrager Evoke hollow rails This is one of three bikes I own so it has very low miles and ride time. It is in great condition and ready to ride. 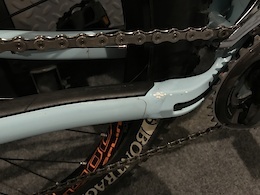 I have covered the frame with clear skin tape in the key areas to protect the frame. Payed $5,000 for this bike less than a year ago with the stock wheels. 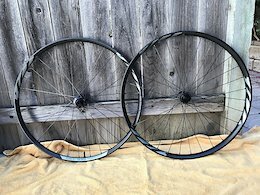 The Ibis wheels are $1,800 upgrade. See below for wheel option pricing. I am 6’ 2” with a 34” inseam and this bike fits me perfect. The measurement of the seat tube from center bottom bracket to top is 20” Price with stock wheels $2,800. Price with Ibis carbon wheels $3,800.